This page provides helpful information for following road cycle races. Here is adescription of major tactics, discussed, and illustrated as needed. There are also definitions of the more obscure terms used by the riders and race commentators. The first two sections mostly refer to the Tour de France, though other extended road races have similar prizes, while much of the glossary contents is, in general terms, universal. Often there is just a change in detail, such as a jersey colour. There are three major tours, which vie for publicity, star entrants and money. These events also jockey for position in the annual calendar. Currently, in order through the season, comes the Giro d’Italia in May, the supremely dominant French Tour de France in July, and the Vuelta a España in September. 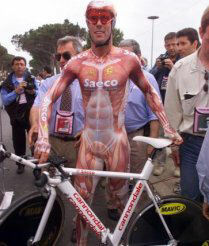 Much to the annoyance of the Italians, top riders will use the Giro as a training run for the Tour de France. They will drop out of the Giro, rather than disturb their training schedule, as they aim to reach peak fitness to coincide exactly with the TDF. Previously, the Vuelta was early in the season and suffered the same annoyances. Nowadays, the Vuelta being at the end of the season, the stars will treat the Vuelta as winding down and demand high appearance fees. But the Vuelta now tends to be dominated by Spanish riders, often famed for their climbing ability. Another irritation is the sprint specialist who will go for stage wins early in a Tour, and drop out as soon as they hit the mountains - Mario Cipollini was famous for this. 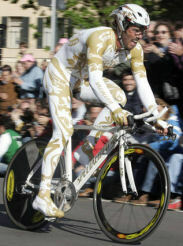 Cipollini was a wild man and one of the greatest sprinters of all time. 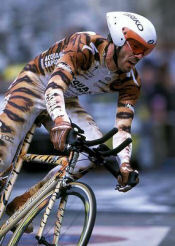 He was constantly being fined for breaches of Tour rules such as riding in fancy clothes, such as a lion suit (he being known as the Lion King), or other imaginative cycling kits. The white jersey winner - best under 25 y.o. in the general time classification: 20,000 euro. For the mountain stages, if the last climb is classed as 2nd or 1st difficulty, or out of classification [hors catégorie] the points for that last ascent are doubled. For details of all prizes, see the 2009 Tour de France regulations [27-page .pdf], from section 1:13 to 1:28.
worn by the overall leader. The colour yellow was chosen because the sports newspaper, L'Auto (forerunner of L'Equipe ) that first sponsored the Tour de France was printed on yellow paper. the under-25 y.o. currently leading. This is no teenager’s game. It takes a long time to build up the strength and stamina to become a top rider. 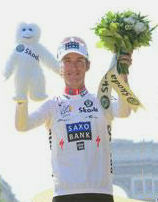 Roman Kreuziger, 2009 Tour de France winner of best young rider (maillot blanc) holding his Skoda yeti peluche. Notice that the bouquet is composed of white flowers, this is also done with the other coloured jerseys. The colour of leader’s jersey for the Spanish Vuelta has varied, and is currently red. the competitor who actually finished the Tour last; named after the red lamp at the back of a train (no lantern for dropping out). There was prize money for the maglia nera and Italy was exceedingly poor, so this prize became of serious interest. The prize had been started to stop fans from pushing off as soon as the leaders had finished. There were no radio communications, so riders had to rely on fans and supporters to make the timing right. The main challengers would hide by the roadside in order to fool rivals into thinking they were still ahead. The winner/loser would wear a black jersey. The black jersey had recently associated with the Fascists. There was much interest in who was black jersey, as well as the maglia rosa. Eventually, the organisers got fed up with waiting for hours for the last cyclist, and interest waned as the war and poverty gradually receded when the '40s gave way to the '50s. These originate from the Union de Cyxlisme International (International Cycling Union, UCI), with a new set produced for every race. However, they are usually pretty similar, particualarly the second section, the "technical sports regulation handbook". This part gives information, with diagrams on how car and motor bike drivers, reporters, photographers and other support technicians must proceed at the start of, during and at the end of each stage. In this linked Race regulations from the 2016 Vuelta d'Espagna, the technical section starts from page 53. Full race rules for the 2016 Vuelta, in 22-page pdf form. Fascinating reading. These are ordinary team members supporting their star rider. Their job is to put him into the best position to win, and to protect him from being worn down. (The teams also vie for a category win). The peloton is regularly moving at about 30 mph/48 kmph, which sets up considerable wind resistance, even on a still day. It is the job of the domestiques to lead out and protect their leader. In among the peleton, various teams are jockeying to make opposing teams do the hard work up front. Nor do you want your leader right in the middle of the peloton, risking domino crashes. So you keep him up near the front, surrounded by his guards. And pace your leader until you run out of energy, in order that he can use his greater strength to finish ahead. You will often see this on flatter stages, where the specialist riders (sprinters) are being led out until the last hundred metres or so. You don’t want your leader burning energy and going back to the supply cars, or dealing with the feeding stations with the attendant possibility of accidents in the melée. If your leader has already built up an individual lead in the Tour, then why go to the front? Let the others do the work. On the other hand, your leader has a chance of taking some of the stuffing out of the recent leaders, and maybe you can break away and carry him over the line, so altering the situation. Naturally, domestiques are not also-rans, but are vital to the success of the leader and the team so, of course, they share in the prize money. If your leader is fortunate enough to win an extra [Crédit Lyonnais] lion or two, he may give you one as a valued souvenir. Not all cyclists have the same skill set, but no real contender can be a slouch in any department. You just about cannot win the Grand Tour unless you are a top climber or time trialist, and damn good at both. Among the ever-present discussions, more like arguments, about whether this year’s Tour, or last year’s, or next year’s, is ‘fair’. There will be claims that the hills are too steep and too many of them, in order to attract and favour a great climber, or perhaps the great home climbers among the Basques. Or the reverse: the climbs are too easy but the time trials are so highly represented that the climbers cannot win. Be aware that modern Tours, despite thousands of kilometres, are usually won or lost by a very few minutes. Remember, in the Grand Tours, the cyclists ride in teams of about ten riders. Sprinters will tend to win flat stages with a final burst of incredible speed on the final two or three hundred metres, in the midst of bumping and barging in a dangerous melee. These are often big riders with big muscles. Much of this is about style and technique. It is essentially flat out riding for an hour, or fifty plus kilometres with highest of high-tech equipment and clothing. It costs millions to put a major cycling team on the road. There are two categories of time trial : team trials, as illustrated here, and individual time trials. These are often light and all muscle and with tremendous, everlasting stamina, to drive their weight up the mountain sides. They gradually wear down the big boys to a state of despair. Sports training is becoming ever more complicated and scientific. The bonk, hitting the wall, resulting from muscle glycogen depletion. Developing one or two hours into a ride, i t is more likely to occur if glucose supplements are not taken during the ride to reinforce internal glycogen stores. Post-ride fatigue, the tiredness after several hours of vigorous riding. A sign of approaching training limits, it can lead to better performance on the next outing. Over-reaching is tiredness after a week of hard training. Recovery may lead to increased speed and strength. Overtraining - this is not good, and can take weeks, or even months of recovery. Training often includes participating in lesser competitions in preparation for a more important one. Thus, riders will cycle in the Italian Giro (and/or the Spanish Vuelta when it used to be scheduled earlier in the year) to prepare for the premium race of the Tour de France. This has caused annoyance to the organisers of the Giro and the Vuelta, when big names participate for enough days to tune their bodies, then drop out so as not to overtrain before the Tour de France. 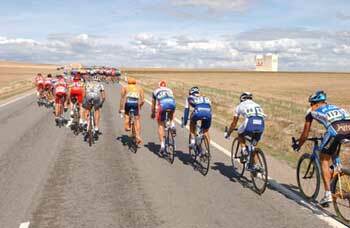 You will see this behaviour during the big, flat stages with side winds blowing across the plains. It also occurs when the peloton is riding along the seaside. Of course, the number of steps in an echelon is limited by the width of the road. This can result in breaking up a peloton. If you cannot get on the first echelon, you are stuck with having to form or join a second or third one. With a group of strong riders in the first echelon, peloton break-ups are quite likely. Rotating: the cyclists peel off the front and drift to the back of the peloton, giving the next in line a turn at withstanding the brunt of the wind. Shielding yourself behind another rider can save up to 20 to 30% of energy on the flat. This varies by cycling speed, wind speed and wind direction. Obviously, this does not apply to a following wind, and is much reduced in uphill sections. Cyclists can produce between about 5 watts per kilogram (that's granny) and 20 watts per kilogram (this is a top sports cyclist) of body weight, so there is a trade-off where putting on more weight gives more strength, but also means more weight to carry. Carrying a lot of weight up a mountain is not optimal - better to be scrawny and tough, but you need big muscles in a sprint finish. The 3;000-plus kilometre Grand Tours are designed to test every aspect of a competitor's ability and stamina. Let's put in a hair-pin mountain, that'll wear them out and see what they've got. Will the cyclist conserve energy as a rival goes ahead? Will a young rival enthusiastically burn himself out? At every approaching tight bend, the cyclist must slow, losing momentum, and then find the extra energy to regain momentum as he comes out of the corner. Such climbs could be designed to take the stuffing our of his legs, and catch him if he has not been managing his energy input adequately. Experience matters at this level of competition. Coming, or is it falling, down such a testing challenge is also no picnic, let alone if it's wet where every corner and badly maintained surface can leave your wheels slipping away from under. Yet if you slow down too much, braver lunatics will be taking time out of you. Again, experience counts. The average age of Tour winners is 28 years old. Young people tend to be brave, or should that be stupid? As people age, they become 'experienced' and so more cautious, or should that be cowardly? Do you want to be right at the front of the peleton, or the race? If you are, you will be breaking the oncoming wind for the riders behind. If you are not, and someone crashes in front of you, you risk going down like nine-pins, or should that be 20-30 pins? And, as part of the team, you may be guarding your leader, almost as a discardable shield, to be sacrificed so he can reach the final sprint and the stage finish in safety, having conserved sufficient energy. But being near the front, but not the actual front runner, can enable a rider to keep out of trouble, from being jostled in the peleton, or clipping a wheel (as in the video above). Thus, the better riders will position themselves near the front of the race, or the peleton, with team mates to protect them from the oncoming wind and from being blocked by members of other teams. There is always a lot of camaraderie on the road with this roughest and hardest of all sports. It’s very difficult for individual riders, or even half a dozen, to break away from the main peloton, for the main peloton can move considerably faster, with its wind-breaking advantages as the leaders change and change about. So why do you so often see breakaways? Well, what’s wrong with a bit of ambition? More seriously, it means your sponsors will have a lot of camera time, which is, after all, for what they are paying. It is also a good way of upping your personal visibility and reputation. Who will be involved in breakaways? It won’t be the top stars. After all, this is a risky gambit. Furthermore, all the top riders watch each other like hawks, and there is no way that they are going to allow a serious rival to gain several minutes on the road. This is so much the case that riders trying to establish a breakaway and finding a serious contender amongst their numbers will tell him to get lost and go back to the main peleton. Why? Because they know full well that the big guns will chase him down, whereas without him, the big guns are much less likely to make the effort. Remember there are team prizes, and a top team will not want to let a seriously competing team escape without inserting one of their own riders in the breakaway. They may even try to sneak in a second rider. If a strong team has managed to get one of its riders away, thereafter it will steadfastly refuse to work at the head of the peloton and chase down the breakaway. There will be other riders going for more minor prizes, such as those for sprint or hill climbing, who will jump out of the peleton to make a dash for a sprint point or a hill crest to grab extra points. Again, they will not be chased down with so much determination as long as they are not treatening the serious contenders. Who else will break away? It’s the fellow who isn’t very high up in the rankings but it’s his birthday, or the race is about to go through, or finish at, his home town; and then there’s always a bit of extra prize money. But do you really want to win a stage? After all, it can make you a target for rival teams. Thus a hot favourite may well prefer to hang back a little for the first few days of a Grand Tour race. 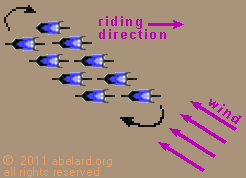 Sometimes the peleton becomes stretched out at the front end, with one or several riders cycling faster, the riders becoming strung out in a line. But it is as if they are attached by an invisible elastic line to the main grouping of the peleton. The front cyclists move ahead, and then are 'pulled' back towards the main pack. In due course, the elastic can be stretched so much, the riders are so far ahead, that the elastic breaks and they have become a breakaway. 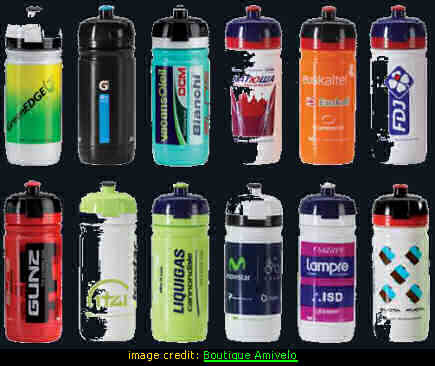 The highly decorated plastic water bottles used by cycle race riders. The empty bidons are discarded by being thrown to the side of the road, where they are eagerly picked up as souvenirs by spectators or fans. Domestiques returning to their team car at the back of the peloton will load up with eight or more bidons shoved down and up their maillots. They may use a bidon gilet [waistcoat] instead, that has rows of pockets on the back into which to easily slot and remove bidons. However, the gilets do hold less than the traditional method. The bidons are distributed amongst team members when the domestique returns towards the top of the peloton. A bibon contains about 50 cl (½ litre). 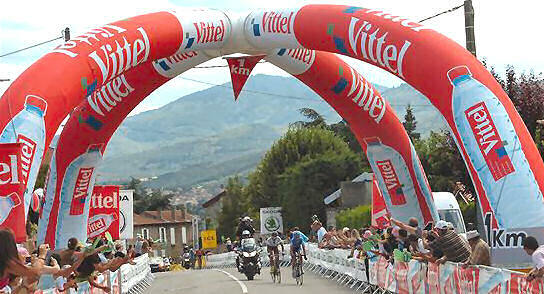 On a long, hot stage of about five hours, a rider can consume 20 bidons, or ten litres! The front cogs on the pedal shaft. New, asymmetric or elliptical front rings are coming into practice as an alternative to the traditional, circular variety. 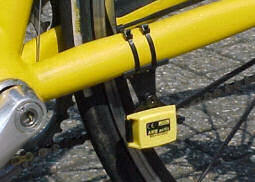 Asymmetric/elliptical rings are intended to minimise the 'dead spot' as a pedal rises, a rider's thrust on the pedals being strongest when the foot is pressing down. There are dubious claims made that these asymmetric/elliptical rings can increase energy transmission. While it is likely that they may reduce fatigue by smoother transmission, increasing energy is another matter. you may find all manner of technical sites discussing these topics. Electronic gear changing is also spreading for its greater speed and efficiency. Hitting the wall, resulting from muscle glycogen depletion. Developing one or two hours into a ride, it is more likely to occur if glucose supplements are not taken during the ride to reinforce internal glycogen stores. Some times called the 'hunger knock'. When a rider jumps his bike as he is going forward, in order to surmount a small obstacle in the road such as a ledge or a kerb. Typically an an older, wiser rider within the team who acts as manager on the road, ensuring all his team's riders are working for their stated goal that day, and setting an example to the younger ones. They will be there in the finishing kilometres of the race. It is unreliably said that, originally, the difficulty of a climb up a slope/hill/mountain was determined by which gear was needed when driving a 35 h.p. car (possibly a 2 CV) up that slope. If it could be driven up the slope in 4th gear, the climb was fourth category; if the car could only go up in 3rd gear, it was a 3rd category climb; second gear made a climb 2nd category, while only being able to climb in 1st gear was categrised as a first category climb. Hors catégorie was used for slopes unaccessible by the car (hors means outside in French). 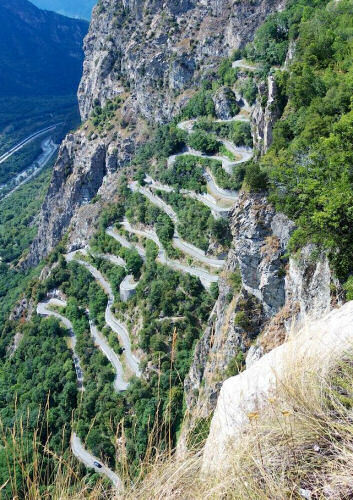 Even today the categorisation of climbs is pretty subjective, as much an art as a science. Gradient still has some bearing on the classification, while if a climb is near near the stage's end, the climb's category may be increased to add more excitement. hors catégorie [HC] : the hardest climbs, which could be a 1st category climb where the stage finish is at its summit, or a climb more than 10 km long with an average gradient of at least 7.5%, or up to 25 km miles long at 6% or steeper. The climb rises at least 1500 m.
Before the actual start of the day's race, the riders can ride without racing to the actual starting point. This ride is called a processional start. The first stage of the 2014 TDF had a départ fictif in York, with a processional start until the real start, officiated by younger members of the Royal family at Harewood House. A sudden acceleration to put pressure on rivals, often several times. French for sporting director. A sporting director manages a sports team, while being the link between the management structure (president, vice-presidents, treasurers), coaches, and practitioners, as well as the race organisers and sponsors. The cycling regulations of the International Cycling Union (UCI) provides that "each team, with the exception of regional teams and club teams must designate a single official appointed sporting director." This designation is a prerequisite to a team registered with the UCI and its participation in competitions on the international calendar. The sporting director is "responsible for the organization of sport riders as well as social and human conditions in which they practice the sport in the team," and establishes the "division of labor" within the management team. This type of brake has been permitted in the Tour de France for the first time in 2018. Trek – Segafredo are one of the first teams to use this technolgy. This type of brake has been developed over several years for use in off-road and track racing. 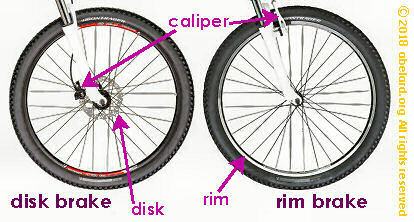 Disk brakes have a strong, light-weight disk mounted at the centre of both wheels. Calipers with hard ceramic brake shoes clamp onto the disk to slow the bike. Disc brakes are much more efficient, more powerful, provide varying degrees of braking intensity, capable of functioning in very wet or dusty conditions. French daily sports paper, with four plus pages containing more statistics and comment on the Tours than you could possibly take in, costing a little over a euro. The flamme rouge is the red pennant at the centre of the archway (l'arche) marking the start of the final kilometre of a stage. (It is also known as the red kite.) In Italy; it is known as l'ultimo chilometro. The flamme rouge has probably been included in the TDF since early days, the 1906 Tour being quoted. In modern, fairly flat stages, because of the melée with its common crashes, the three-kilometre mark is also used as a marker. After the 3 km marker, if there is a crash, any part of a group that is held up by the crash is allocated the same time as the part of the group that was not held up. This rule does not apply for high climb finishes. 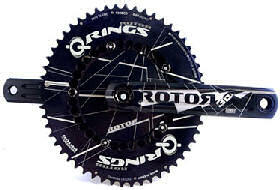 A bigger gear is obtained by either or both a larger front cog (ring), or a smaller back cog (sprocket). French for the Big Start - the celebratory start as the circus gets under way on the eve of the first day and the first day itself of the race. This is a big deal for the town and the country concerned, who do as much as they can to encourage enthusiasm, spectators, associated visitors and tourism, as well as revenue. [Italian] a small group of riders. When one rider helps another rider to speed up by holding hands, pulling the helped rider forward. This is against Tour cycling race rules. It used to be common, even a pushing a leader up a hill. However, such assistance is increasingly frowned upon. A minor infraction may draw a small fine, bigger ones like Nibali hanging onto a car for 150 metres can get the rider disqualified (Nibali: 2015 Vuelta d'España). This manoeuvre was developed, at the end of the 19th century in the United States, as part of the 6-day races called Madisons. Thus, in France, a handsling is often called an American. Australian term for a U-turn, or a very tight turn. The chap or chaps pacing a team leader, especially on a sprint, protecting his fastest sprinter to the last possible moment. Extended line as the pace is increased. Alternative mechanisms for switching cogs - this is technical, look it up on a specialist page. A cyclist gets a puncture, or falls in a peloton crash. Well, of course, he needs a bit of medical attention, and surely his brakes will need a bit of adjustment. So, his arm receives careful attention while the rider holds onto the car. Or, the mechanic has to lean out of the car, holding onto the bike, while he uses his magic spanner to do some adjustments. This is very helpful in giving the cyclist a bit of assistance to regain his place. Another useful device is the sticky bottle. The guy in the car handing it over finds it a bit difficult to let go. 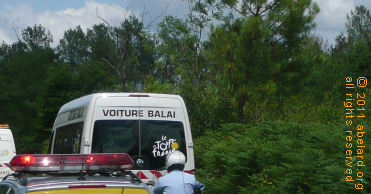 If necessary, the commisionnaire's car will toot to remind those concerned not to linger. French for a jersey; the close-fitting jerseys worn by cyclists. The overall leader and leaders of other classifications wear specific colour maillots, while team members wear maillots that, essentially, advertise the team’s sponsors. Sports clothing is now a vast and technically sophisticated business, far too complex to go into here. Flat out. When cycling flat out, if sitting, a cyclist may sit right forward on the edge of the saddle. 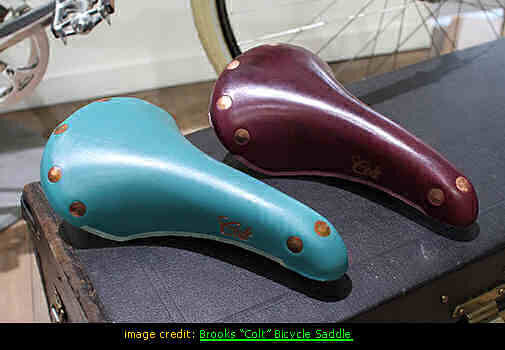 In the old days of leather saddles, the leather was held in place by rivets at the front (and the back) of the saddle. such as stage wins, 1st on La Vuelta, 1988. The sensation a rider feels when he is so tired that he loses pedalling rhythm, he can no longer pedal smoothly and each downstroke jerks. This can also occur when cycling on too small a gear - for instance, when going downhill. 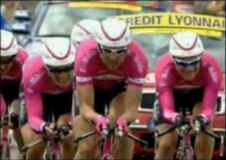 The main, often compact, group of riders, sometimes written as ‘peloton’ in English. Derived from pelote - a small, compact ball of silk, wool or rubber, also an army platoon. (The Basque game of pelote uses a small rubber ball.) Also related to the English word ‘pellet’. Riding without racing from the nominal stage start, the départ fictif, to the definitive start of the day's race. Grazes resulting from sliding along the road surface during a fall. Heavy spray of rainwater kicked up by the bikes rear wheel in very wet conditions. Not much fun to ride behind. is the team bus base. • domestiques are called gregarios. • The hardest day’s cycling is called la etapa reina - the queen stage. • An uphill time trial is el chrono-escalada. • cola de peleton - tail of the peleton. • Bonk in Spanish is pájara. There is also a Vuelta climb known as Pajares between León and Ovedo. • cabeza de carrera - head of the race. • a chuparruedas is a wheel sucker. • Especial (ES) is the Spanish equivalent of a Hors Categorie (HC) climb. • Perseguidor - pursuing or chasing rider. For example, the people who hand out the musettes of food and drink (from the French for carer). Soigneurs also look after the riders at the team buses and during their stays in hotels. Cogs on the back wheel. bluddy dangerous (as in a descent or a final sprint through a town). Italian word, describing a group of fans or supporters. average speed across all riders. the transponder probably will not be transferred to a replacement as that would take too much time. Previously, a boxed magnetic timing chip (placed exactly 1.2m behind the lead edge of the front tyre) enabled the verification and scoring of each rider's arrival at a stage's finish. However, the box could cause problems when changing a rear wheel. Rider who rides in other riders’ slipstream, making little effort themselves. The following is an exceeding boring book, almost like reading a telephone directory. It has notes on all previous runnings of the Vuelta. However, in among the addresses and telephone numbers you will discover all manner of hints on cycling road race tactics, with interposed examples of dubious practice and cheating. You will also find snippets on the disturbed political background of Spain, from right back to the Civil War and the Franco regime, and going up until modern times, against which times the Vuelta has been held, or not held. Pedalare! Pedalare! is very similar to Viva La Vuelta! , but relating to Italian cycling and the Giro. This book is less of a telephone directory. It gives less background on the actual race, but more on the culture of cycling from the days when cycles were an essential part of the slow modernisation of Italy. Pedalare! Pedalare! is generally rather shallow and a bit romantic. There is a useful section towards the end about doping, which amounts to “It’s always with us, and always has been”. The Bonk describes the disastrous moment when suddenly there is nothing left in the tank. Legs become as jelly, and to reach the finish line requires enormous will power to keep going to the end. The body’s glycogen store produces the energy needed to perform effectively. During long-endurance exercise, the body’s store of glycogen is depleted. When the glycogen is completely depleted, the body has no more fuel. Instead it burns fat which results in a rush of exhaustion and the accompanying collapse in performance. To counter this problem, generally riders will use a sports drink, together with supplements to replenish glycogen stores during the ride. The drink has the additional benefit of hydration. Tour de France participants are estimated to receive half their daily calorie intake from on-bike supplements. Obviously, choosing the right carbohydrate sports drink is vital. The sports drink choice requires balancing glycogen replenishment and rehydration, as the two interact. Greater carbohydrate in the drink detracts from rehydration, while causing digestion problems. Thus, generally riders choose an isotonic drink with 6-7 per cent carbohydrate. This appears to give a good balance between hydration and glycogen replenishment.